Surrounded by lushly landscaped terraces that slope gently toward the Pacific, this resort overlooks beautiful Keawakapu Beach. Ideal for active couples and families, it offers a range of accommodations, including private studios, one- and two-bedroom condo units, and a wide variety of recreational fun for your Maui escape or family vacation. Guests enjoy four swimming pools - one overlooking the ocean - paddle tennis, shuffleboard and a beachfront pavilion. Located in Wailea, approxtimately 18 miles from Kahului Airport. 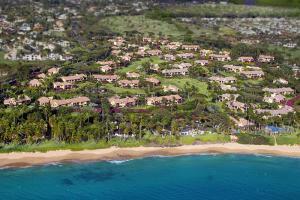 The Wailea Ekahi Village is close to some of Maui's most beautiful natural attractions. Keawakapu Beach, with its well-padded, sandy bottom and gentle surf, is perfect for frolicking and family fun. The reefs beyond offer great snorkeling and swimming. In addition, Wailea Ekahi Village is close to all that the Wailea resort area has to offer, from world-class golf and tennis to gourmet cuisine and exceptional shopping.